My mother also learned to cook from granny, so vareniki with mashed potatoes (вареники с картошкой) together with borscht forever stayed around in our kitchen. Whenever made at our home, they were great. Large, filled with thick and flavorful potato puree seasoned with caramelized onions, served warm in melting butter or with cool sour cream. Sooner or later I would have to learn to make them anyway to preserve the family tradition. That's how it get's passed on. It didn't go completely smooth first time, but starting from the second attempt I got comfortable with the process. The recipe is a good choice if you are in the mood for some two hours of fun and relaxed cooking. For the filling peel and finely chop the onions. Heat 2-3 tbs of vegetable oil in a medium pan. Add the onions and cook on medium heat, stirring till they get golden. Peel the potatoes and place them in a large pan. Cover them with water, bring to the boil and cook (lid on) for around 20 minutes till soft. Drain the potatoes (keep the cooking water). While the potatoes are still hot, mashed them with a hand masher. Mix in some some cooking water to reach a thick puree texture. Add salt to taste, 2-3 table spoons of vegetable oil and season with pepper. Mix in the onions, cover and set aside. For the pastry place 120 g of four and a tea spoon of salt in a large bowl. Pour in the water (it must be very hot, almost boiling) and rapidly stir together using a spatula till the mixture gets even. As the water is very hot the mixture will look lumpy at first. That's OK, if you stir it energetically it will come together nice and smooth. Using your hands form the dough into a long cilinder around 3 cm in diameter (it is easyer to separate the dough into 2 parts and do it twice). Cut the cilinder into 3 cm chunks. Roll each chunk into a round, some 1-2 mm thick (you'll need to flour the table and roller, otherwise the pastry will stick). Put around 1 tablespoon of mashed potatoes on each round. Slightly brush the sides of the pastry with water. Fill a large pan with water and bring it to the boil. Add some salt (same amount as you add for cooking pasta). Add the vareniki 5-6 at at time. Cook on medium heat. Gently move them around to prevent from sticking to the bottom of the pan. After they come to the surface, cook for some 6 minutes and take out. I made a pure vegetarian version of the recipe this time. If you feel like enriching it, add milk instead of cooking water to the mashed potatos. Then, when the mashed potatos cool down, mix in one raw egg. 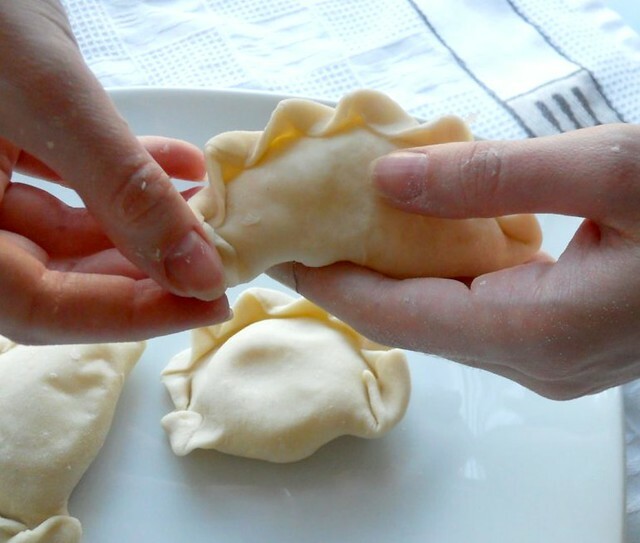 Serve the ready vareniki immediately, with vegetable oil or butter and sour cream. I really love the seal that you do. there are sooo many ways to make these - my grandma added egg to her dough, and rather than plain water, we reserved the water from boiling the potatoes. the starch makes a more tender dough. 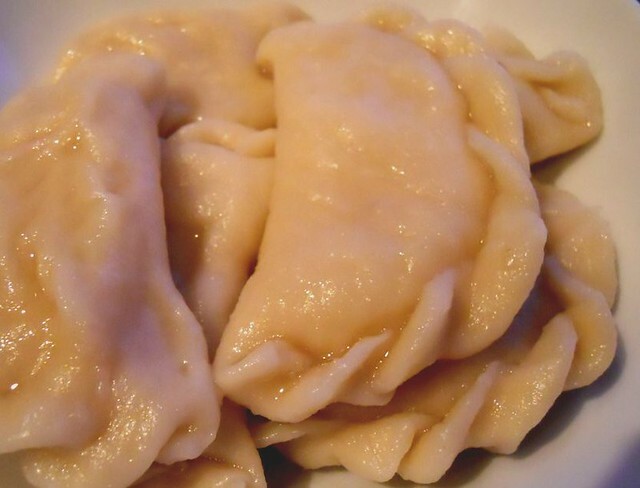 Have you ever tried fruit perogies, eaten with sweetened sour cream? to die for. we also reheat leftover perogies in a frying pan and then add heavy cream and fresh dill, which thickens and make a sauce. The reheating option you describe makes me hungry. I reserve it for my next occasion. Thank you for the VEGETERIAN version of this recipe and for the pictures. I am vegan and had the hardest time adapting the traditional family recipe to my lifestyle. I love the "lock" that you did, this makes them look so much fancier than mine. I also add finely chopped mushrooms to my potato and onion filling. I think they taste fantastic served with a light coating of olive oil, and generously sprinkled with green onion, parley, dill or all of them together. Other types of filling I use are stir-fried cabbage and onions, and fruit jams.